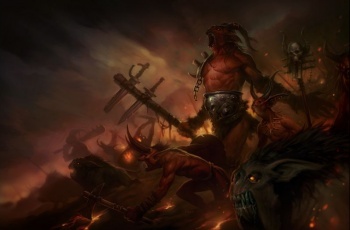 Blizzard may love its e-sports, but it doesn't want them in Diablo III. As demonstrated here at BlizzCon 2010, Blizzard's games have a very dedicated competitive multiplayer fanbase, whether it's World of Warcraft's arenas or the tournaments for StarCraft and StarCraft II alike. With the recent announcements of PvP arenas in Diablo III, wouldn't you expect Blizzard - one of the biggest advocates of videogames as a sport - to plan the same in its upcoming hack-and-slash? When asked if Blizzard planned on supporting competitive multiplayer for D3's PvP arenas in the Q&A panel for the game, the game's big boss Jay wilson gave a fairly emphatic "no." The reason, he said, was because the Diablo games - including the dueling in Diablo II - were always in part about finding out the most overpowered builds. If Blizzard wanted to make it an e-sport a la StarCraft II, the designers would have to suddenly prioritize balance above all else, rather than making fun (and potentially abusable) abilities. "If Diablo III was an e-sport, PvP balance [would dictate] everything ... we don't want that." That doesn't mean that players can't hold their own impromptu e-sport activities with Diablo III's arenas, said Wilson - after all, it was their game to play. Blizzard just didn't want to be involved with it: "You can do whatever you want, but we're specifically not incentivizing it."